Linz Sews: Pants to Skirt - a tutorial! Pants to Skirt - a tutorial! 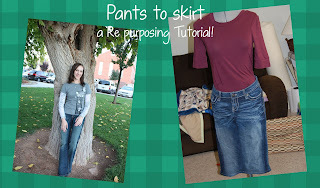 Today I am going to share my semi-hack method of turning a pair of pants into a skirt! I have done this several times, and I will say honestly - these skirts are my favorites! Always really comfy! First off - this works BEST with wide leg pants. Skinny jeans just won't work. So don't do it! :) Also, this might be a good "When you're alone" project - because you have to try it on several times throughout, and so, sewing in your undies makes it easier! lol! Trim off the extra fabric. There may be a bit of a pucker at the base of the zipper. It is okay. I have found that it wears well, and looks fine. Don't stress about it too much! Now, try them on. Here, you want to - with your hand - get a feel for how far down you can sew down the back. You CANNOT sew it all the way down if you want to be able to walk. I have found that about 5 inches from the booty seam is as far as I like to go. Get an idea - then take them off, turn them inside out and pin at the point you will sew to. This will be from the base of the booty straight down. Pinch the thick seam and sew straight down, as shown. Trim off the little triangle piece! Time to try it on again! :) This time to determine the desired length. Remember to add 1 inch for hem allowance, then pin at your desired length! Now, I have found that if you are going about knee length or shorter - the part you just cut off is perfect to fill in the back! Or - you can get spunky and use a contrasting fabric. I decided to use ruffle fabric!! Lay your filler fabric in the opening in the back. Flip it all inside out, then with right sides together, pin both sides of the triangle. Sew it! - 1/2 seam allowance here. You may also want to zigzag or surge the edges to prevent fraying. Here we are so far! Now trim off any pieces that are hanging down below the end of the skirt. Now, it's time to hem it up! Press 1/2 inch, then another 1/2 inch to create a beautiful hem! Pin, then stitch all the way around! **I did not hem the ruffle fabric part, as it is a knit and won't fray. If you use the leftover denim or other fabric, DO hem it all the way around! And now, you are done!!! Congratulations!! Enjoy your new skirt! Thanks for sewing with me! The ruffle fabric makes it so cute!! This is so cute Linz!!! Great tutorial!! Cuteness. We used to do this in the hippie days (yup, the 1970s), but filled in both the front and back V's with fabric, making it more of a flared skirt. Fun to see this version! who is catching up on her blog reading after being gone for a while. Bella Patchwork Wedding Quilt Finish! TGIFF - King Size Edition!